SOF News Update 20170301 – NVA Commandos in Vietnam War, SOLIC Symposium, Russia’s Delta Force, strategic CT failure, movie about Green Beret Bo Gritz, USMC’s new sniper rifle, National Geographic’s “Chain of Command” – 3rd SFGA in Niger, and SOF cameraman. A Return to Writing. The holiday season has passed (quite a few weeks ago), vacations are over, and a long-term, intensive writing assignment is nearing completion. SOF News will now resume its (almost of daily posting of SOF related news) and the publishing and emailing of its weekly newsletter. Another big writing project looms ahead so . . . no promises. In the meantime – enjoy. If you have any news to share with the SOF community send it to staff@sof.news. North Vietnamese Commandos. A LTCOL, Commandant of the Special Operations Training and Education Centre in Australia, writes about the activities of the NVA commandos that contributed to the overall broader strategic campaign of North Vietnam. Read “Special Operations for Strategic Effect: Vietnamese Communist employment of Commandos in War”, The Cove, February 27, 2018. Operation Halyard. Read the story of one of the greatest rescue missions of American airmen conducted by a three-man OSS team dropped into Serbia during the Second World War. Hundreds of American and allied airmen were airlifted out of Yugoslavia and back into Allied control. Read “Operation Halyard, One of the Great Rescue Stories of WWII”, Special Operations.com, February 28, 2018. SOLIC Symposium. The National Defense Industrial Association’s 29th annual SOLIC Symposium began on February 28th in Arlington, Virginia. One keynote speaker was Mark Mitchell – a career Green Beret officer – and currently the principal deputy assistant secretary of defense for special operations and low intensity conflict. Read a news report of his comments in “Special Ops Must Be More Lethal, Effective, Efficient, DoD Official Says”, by Jim Garamone, DoD News, February 28, 2018. Belguim Parachutist Dies in Yuma, Arizona. A member of the Belgian Special Operations Forces died during a training accident in Arizona. (Stars and Stripes, February 28, 2018). Retired SF General Now Supports Veterans. Brigadier General (Ret) Don Bolduc has retired to the quiet life of New Hampshire after a long career of serving in the U.S. Army and in Special Forces. His last assignment prior to retirement was as commander of Special Operations Command Africa (SOCAfrica). But now he is on a new mission – providing support to veterans. Read “Bolduc: People Come First”, The Laconia Daily Sun, March 1, 2018. SOF Recruiting Problems. USSOCOM is facing a recruiting challenge that may force it to be more choosy about the missions it takes on in the future. “Pentagon Official: Recruiting Problems Could Alter Special Ops Mission”, Military.com, February 28, 2018. Army Spouse of Year. A Gold Star Spouse and wife of a 1st Special Forces Soldier has been selected as the “Army Spouse of the Year“. (DVIDS, February 25, 2018). 7th SFGA Vet’s Wife Faces Deportation. The wife of a retired Green Beret is facing deportation to her native country of Honduras. She is caught in a ‘catch 22’ situation regarding her legal status. Read “Wife of 7th Special Forces Group vet faces deportation under tighter immigration rules”, Army Times, February 28, 2018. 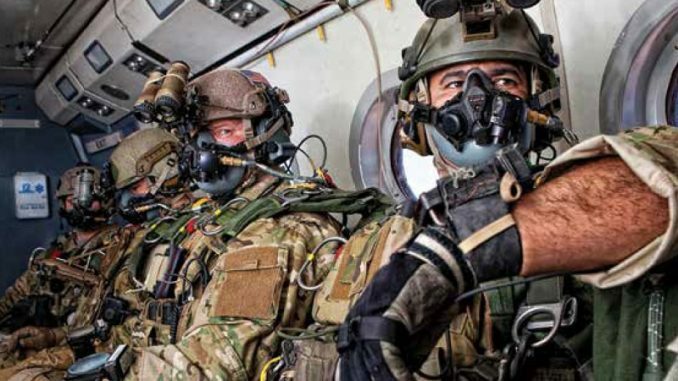 NSW and Army SOF Aviation Train with French. Naval Special Warfare units and U.S. Army Special Operations Aviation Command crews conducted interoperability training with a French amphibious assault ship in the Arabian Gulf in February 2018. See “U.S. and French forces participate in contingency training”, DVIDS, February 28, 2018. Russia’s Delta Force. Russia is slowly building the capabilities of it’s 2,000-man strong KSSO – an organization similar to the U.S. Delta Force. The KSSO is a part of the much larger community of special designation forces in Russia – known as Spetsnaz. Read “Russia Has a 2,000 Strong ‘Delta Force’ That is Ready for War”, National Interest, February 28, 2018. Strategic CT Failure? Alex Gallo, a senior associate with the Center for Strategic and International Studies (CSIS) and former Deputy Director and now Fellow with the Combating Terrorism Center at West Point, says we need to innovate in our counterterrorism policy – failure to do so could make the “long war” truly the forever war. Read his article in “Strategic Counterterrorism Failure? Why We Continue Doing the Same Thing and Expecting Different Results”, Modern War Institute, March 1, 2018. U.S. Navy SEAL Survival Handbook. This book provides information from basic camp craft and navigation to fear management and strategies for coping with any type of disaster. It has 150 color photographs and covers life-saving information on weapons, survival tools, finding water, wildlife for food, shelters, signaling, sea survival, and more. It is now available at the Navy SEAL Museum online shop. Movie about Bo Gritz. One of the Army’s most decorated soldiers from the Vietnam conflict was LTC (ret) Bo Gritz. He is quite the personality that achieved even more fame after his retirement from the Army. He twice ran for President, engaged in private sector POW rescue missions into Laos, and was pictured on the cover of Soldier of Fortune Magazine. A movie has been published about Gritz that claims to accurately portray his career, exploits, and life. You can watch the movie trailer of Erase and Forget (January 2018) at the link below. TV Special – SF in Niger. The 3rd Special Forces Group of Fort Bragg, NC was featured in National Geographic’s special entitled Chain of Command: Part 8, ‘Why We Fight’. The one-hour long program aired on Monday, February 26th. It was a moving program that depicted the deployment of a 3rd SFGA detachment on deployment to Niger and then – later the memorial service at the JFK Chapel on Ardennes Street, FBNC for four of the team members who died in an insurgent ambush in Niger. The program is available online at . USMC’s New Sniper Rifle? The Marines are interested in the M110A1 Semi-Automatic Sniper System (CSASS). Read “The Marine Corps May Finally Get a New Sniper Rifle – Just Not the One They Need”, Task and Purpose, February 22, 2018. Interview of SOF Combat Cameraman. A combat cameraman is interviewed by Marty Skovlund, Jr. about his time as a young PFC assigned to Task Force in combat zones to film combat footage during missions. Watch this 7-minute interview of the combat photographer published on February 28, 2018. 353rd SOG and Cobra Gold. The 353rd Special Operations Group has completed joint training with the Royal Thai Air Force (RTAF) that included low-level flights, military free fall, and other tactical exercises. (DVIDS, Feb 23, 2018). Photo Credit: HALO jumpers awaiting the green light. Photo is from page 5 of ARSOF 2022, a USASOC pub.